StockTwits chatter was dominated by stocks of questionable investment value (JAZZ), so I’m taking a look at the S&P 500 ETF SPY for some perspective on the market. 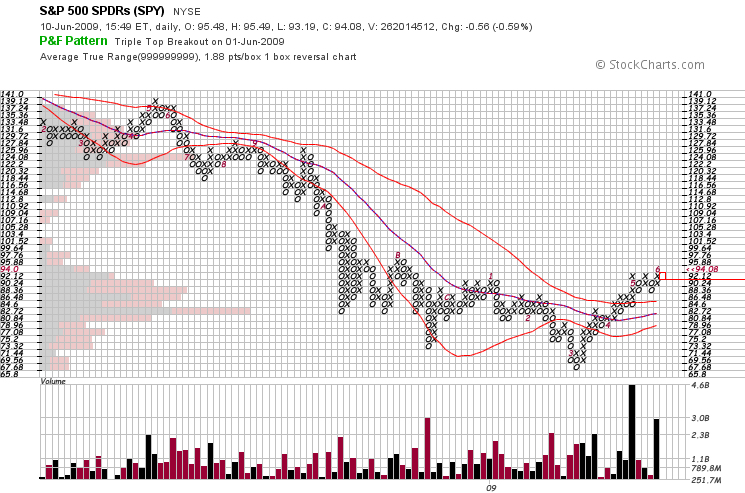 Despite today’s pullback, the SPY remains in an uptrend, and is trading well above the upper Bollinger. Clearly momentum has slowed since May, but so long as the trend remains bullish, I will continue to purchase stocks trading at new highs with short squeeze potential. Use this screen to find potential candidates like AutoNation (AN), VistaPrint (VPRT) and Synaptics (SYNA). just noticed NTES on the 52 week high list today. pretty large short position, though not >20%. The chart looks great http://bit.ly/gKRPf. I use the Bollinger bands and moving average to formulate position size and stops. A quick glance at NTES earnings suggests their EPS has grown 50% Y-O-Y, but I’m not particularly interested in the fundamentals. Clearly the market is accumulating NTES, though the final destination is unknowable, it’s probably higher.